IRVINE, Calif. – Spectrum Wine Auctions, the world’s newest live and online auction house of fine collectible wine, announced today that its premiere live auction scheduled for November 21, 2009, will be anchored by a selection of wines from “The Aubrey McClendon Collection.” The auction will be held at The St. Regis Monarch Beach Resort in Dana Point, Calif., with live auction simulcast in Hong Kong. McClendon is considered by many in the wine world to be the greatest American wine collector, having built an extensive collection highlighted by the best vintages of French Bordeaux, as well as a deep collection of impressive Napa and Burgundy selections. “The Aubrey McClendon Collection” offered by Spectrum Wine Auctions in November will feature more than 3,000 bottles. McClendon co-founded Chesapeake Energy Corporation (NYSE:CHK) in 1989, which today is one of the largest producers of U.S. natural gas, where he currently serves as chairman of the board and chief executive officer. A special element of the auction is an interview granted by McClendon conducted on August 13, 2009, by Mario Sculatti, director of sales and consignments for Spectrum Wine Auctions, which is viewable at www.spectrumwine.com. The interview presents a rare and exclusive look into the interests and philosophies of this great collector, and finishes with Mr. McClendon signing an Imperial of 1990 Lafite Rothschild that will be offered during Spectrum Wine Auctions’ November 21 auction, with commissions earned to be donated to charity on behalf of Mr. McClendon and Spectrum Wine Auctions. “It has been both educational and inspirational to have spent time with Aubrey enjoying his passion for wine as well as gaining insight into his business philosophy and his history building Chesapeake into one of the largest independent oil and gas companies in the country,” Roberts concluded. The rarest bottles of Latour offered in the auction, two bottles of 1945 Latour with outstanding fill levels. Also, 36 bottles of the legendary 1959 vintage. Chateau Latour is a glorious producer, and these gems are true treasures indeed. Possibly the most prestigious lot in the entire sale is a full original wood case of 1959 Lafite Rothschild, a rare treasure indeed. Twelve bottles of 1982 Lafite Rothschild in the original wood case is another amazing highlight. There are a total of 16 full original wood cases of the famous 1998 Lafite. Many other full cases and large format bottles of Lafite are sure to gain attention. One of the most coveted wines in the world, the diamond of Pomerol. The auction presents three bottles of 1959 Petrus, 45 bottles of the esteemed 1995 Petrus, and banded original wood cases of the newest vintages as well. One of the greatest big bottles in the sale is a 6-Liter of 1982 Cheval Blanc in original wood case. A stunning trophy for the collector. Imperials, including some from the 2000 vintage. 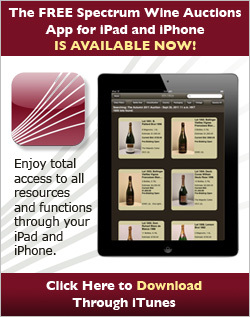 The weight and variety of Mouton Rothschild in the November sale is exceptional. One of President Thomas Jefferson’s favorite chateaux in all of Bordeaux, Haut Brion is another shining light of the November sale presenting 26 bottles of the 1959 Haut Brion. Other highlights include the perfect 1989 Haut Brion in 6-liter Imperial. A selected parcel of Screaming Eagle includes original full wood three-packs of many vintages. Two magnums are being offered, the 1993 and 1998 vintages, an incredibly rare format for this cult Napa Valley cabernet sauvignon. A true American First Growth property, Harlan Estate is a prominent feature in the November auction, including a depth and breadth of Harlan’s greatest vintages: 1994, 1997, 2001 and 2002, in bottles and magnums. Spectrum Wine Auctions is pleased to offer more than 350 total bottles of Harlan Estate in the sale. The 2000 Pavie from St. Emillion is considered by many to be one of the greatest wines of the 2000 Bordeaux vintage, and possibly ever made by Pavie. The November auction offers 108 bottles of this one wine, nine lots in original wood cases. 1959 Palmer in 375ml half-bottles. 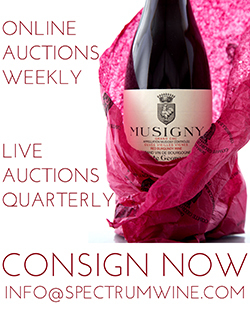 The auction offers three original wood cases originally shipped by négociant Mahler-Besse from Bordeaux. Each 24 half-bottle case is piece of history, with every bottle wrapped in a natural straw sheath. Spectrum Wine Auctions is scheduled to host its premiere live auction on Saturday, November 21, 2009, anchored by The Aubrey McClendon Collection. The McClendon interview is viewable at www.spectrumwine.com, and complete auction schedule and details will be posted in the coming weeks. Interested parties are invited to call 888.982.1982 for additional information and questions. Spectrum Wine Auctions is pleased to announce that Amanda Keston has joined the company as director of client services. Her extensive experience in wine auctions includes Zachys Wine Auctions where she successfully led the organization’s West Coast Operations for more than five years. An expert in developing client relationships and planning world class events, Keston brings a wealth of experience and an eager group of new buyers to the Spectrum Wine Auctions team. Prior to Zachys, Keston worked for internationally recognized high-end retailer Harry Winston, and auction house Christie’s, where she facilitated the sale of millions of dollars in luxury goods such as jewelry, art and antiques, while also refining her palette for fine wines. Keston holds a Bachelor of Arts degree in art history from University of California at Santa Barbara, and she is very active in Los Angeles based charities, including holding a position as young council member of Lupus L.A.